It has been 41 years since Volkswagen’s iconic hatchback debuted in the United States and this fan-favorite vehicle is showing no signs of slowing down. With plenty of awards to be proud of and a plethora of devoted drivers, the Golf continues to represent a dynamic combination of value, space, performance, and technology. Available in two trims (S and SE), the 2018 Volkswagen Golf is a smart choice for people who want it all. The Golf offers a spacious cabin for a vehicle of its size with 93.5 cubic feet of interior room and 16.5 cubic feet of cargo space up to the parcel shelf and 22.8 cu.-ft. to the roof. Under the hood of the 2018 Volkswagen Golf, you will find a compact turbocharged and direct-injection 1.8-liter four-cylinder TSI® gasoline engine. This engine has a state-of-the-art design that uses intelligent downsizing to give you superb power and torque as well as efficiency. The engine is then paired with either a sporty five-speed manual transmission or an optional six-speed automatic transmission with Tiptronic®. 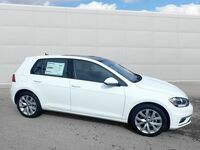 The Golf’s new engine allows the vehicle to reach a horsepower rating of 170 at 4,500 rpm and a torque peak of 199 pound-feet (with the automatic transmission). This seventh-generation Golf is back for 2018 and better than ever with a host of updates that really bring out its appeal. A striking new front bumper and chrome-surrounded grille are flanked on either side by bright LED daytime running lights with a light signature. The versatility of the interior and cargo load space is enhanced by a trunk floor that can be moved up or down by 3.9 inches, while the 60:40 split backrest can be folded to give an almost flat cargo area that easily accommodates a full-size bicycle. With the rear seats folded, the Golf has 52.7 cu ft of cargo capacity, which is plenty for any hauling trip like grocery shopping, moving, or camping. Other notable interior features found available on the 2018 Golf include V-Tex leatherette seating surfaces, KESSY keyless access with push-button start, heated front seats and Voice Control. 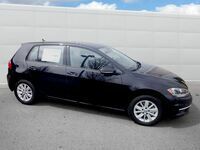 Interested in a Volkswagen Golf?